CHOISE's scientific studies are organized around four research thrusts. Each thrust has two leaders: one from a national laboratory and one from a research university. As shown in Figure 1, Thrust 1—Hybrid Organic-Inorganic Semiconductor (HOIS) Design and Synthesis—overarches the work within the other three thrusts. Furthermore, continual feedback between computation and experiment enables rigorous development of structure-property-function relationships and design rules for realizing emergent phenomena. Learn about key scientific concepts that encompass our research. Figure 1. Thematic and operational links between the four thrusts. 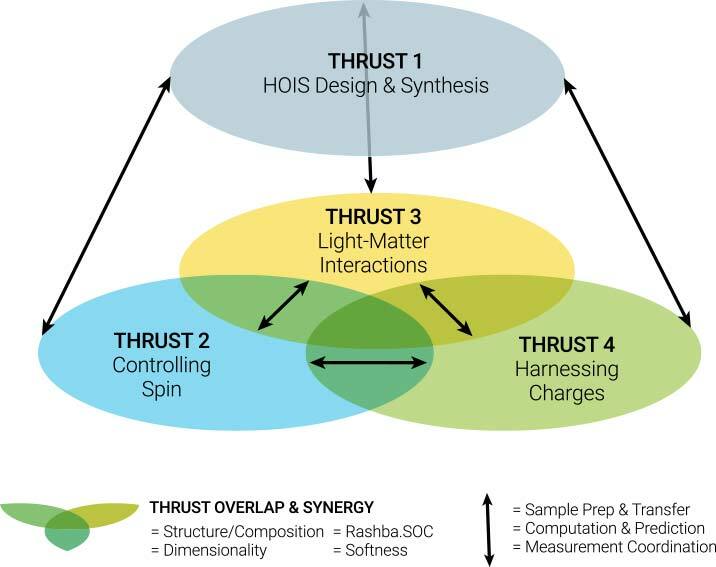 Thrust 1 leverages the distinct attributes of hybrid organic and inorganic chemical systems and employs new preparation and characterization approaches guided by computation to systematically advance rational synthesis of complex solids. Design/demonstrate complex hybrids to achieve novel physical behaviors. Develop novel preparative methods that balance the disparate requirements of the targeted inorganic/organic components to achieve high-quality crystal/films. Employ in-situ experimental probes and advanced ex-situ characterization to guide organic/inorganic hybrid synthesis. Build nanostructured components with unique functionality. Long spin-coherence time present with large spin-orbit coupling (SOC) provides great opportunities for spintronics. What gives current Pb-based HOIS the unique ability to have large SOC yet exhibit long spin-coherence times? We hypothesize that we can control Rashba and Dresselhaus effects by compositional tuning of 3-dimensional/2-dimensional systems, along with incorporating strain and/or electric fields. These spin phenomena are necessarily related to topology. As we gain control and better understanding, we will examine novel topological phenomena at surfaces and interfaces. 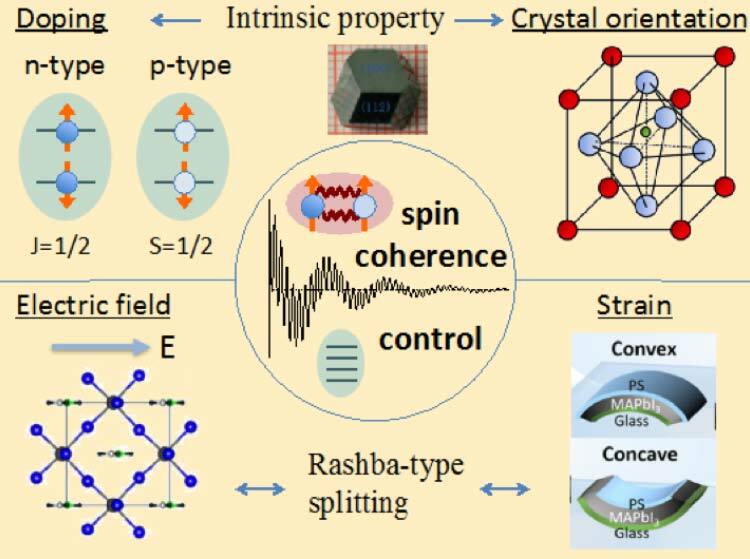 Elucidate how SOC relates to spin-coherence times by controlling/tuning Rashba splitting via strain, doping, dimensionality, and composition. Learn to inject and harvest spins in spin-based architectures. Explore the effects of dimensionality on controlling spin relaxation. Uncover how to realize topologically protected states. Figure 2. Spin-coherence control through doping, crystal orientation, electric field, and strain. Light/matter interactions play a fundamental role in many technologies, such as light-emitting diodes, photodetectors, lasers, non-linear optics, photovoltaics, and quantum information processing. 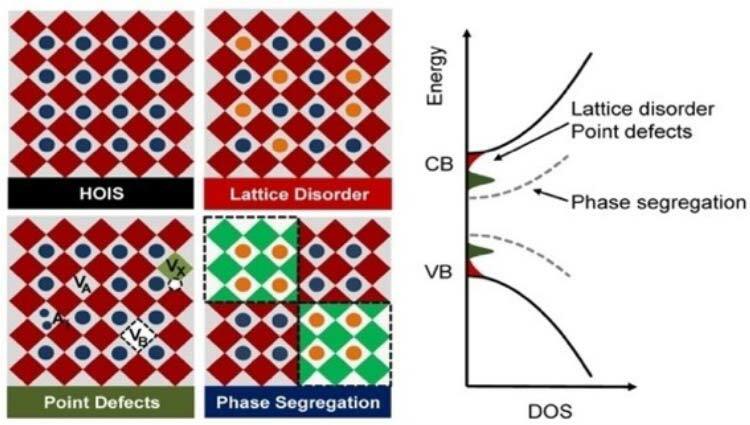 Optical response is intimately tied to lattice and composition (both bulk and surface), density of electronic states and occupation in both conduction/valence bands, and spin degree of freedom. However, we lack detailed mechanistic understanding of these connections. Uncover the role of structure and composition on ordering of electronic states and optical selection rules, and tailor photo-physical phenomena. Elucidate and control the factors that govern narrow- and broad-band emission. Interrogate the level splitting, structural asymmetry, and Rashba terms by their connection to nonlinear optical interactions. Elucidate the mechanisms governing light-induced structural changes. Investigate the photocatalytic potential of HOIS systems. Many unusual charge transport, recombination, thermal relaxation, and electromechanical behaviors have been observed—yet, the origins of these phenomena remain unclear. We elucidate structure/function properties that govern how charges interact with the lattice to induce unusual optoelectronic properties. Interaction of charge carriers with defects, strain, and phonons. Charge transport/recombination near, at, and across interfaces. Emergent phenomena associated with lattice distortion, polarization, and doping. Interaction of carriers and phonons to slow carrier cooling (hot carriers). Examples of structural disorders and their potential impact on electronic properties.